The streets around Los Feliz are unusually quiet for a Saturday afternoon; an elderly couple is out walking a toy poodle as a jogger waves from across the street. A screech of tires shatters this ideal as Busdriver comes careening out of the L.A. underground hip=hop scene and onto the strees of an unsuspecting America. 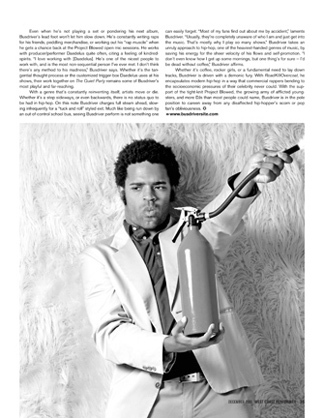 Known to his accountant as Regan Farquhar, Busdriver has been pummeling open mics and live shows wth his fast-paced flows and unflagging intensity for longer than there has been a Wayans on TV, and has collaborated with the likes of DJ Z-Trip, Daedelus, anger Mouse, Daddy Kev, and even ex-Unicorns Nick Diamond and Jamie Tambour. "I got taken into the fold early on," says Busdriver abut his involvement with L.A. rap braintrust Project Blowed. "They brought me in as one of the new soldiers, ran me through the ropes, and I've been working with them for the last 15 years." One thing separates the wheat from the chaff, and it's pretty much exclusive to the core ability of Blowed's roster: "Our crew is based around an open mic. It's intrinsically part of each of our talents, making us challenge ourselves, but doing i with confidence.," says Busdriver. Project Blowed is definitely known for getting up in people's faces, and even had it out with Anitcon a few years back. "Our group was pretty snobbish and outspoken," laughs Busdriver, "especially when it came to artsy-indie kids wanting to make similar sounding music to what we were putting out. 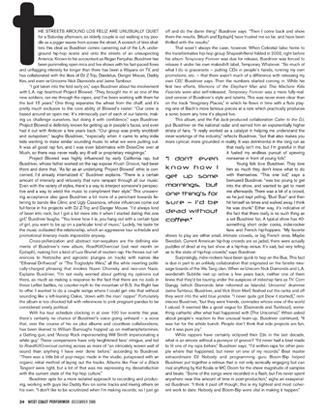 It was all good rap fun, and I was even labelmates with DoseOne over at Mush, so there was never really any ill-will or proprietary misgivings." Project Blowed was highly influenced by early California rap, but Busriver, whose father worked on the rap expose Krush Groove, had been there and done that. "As far as an underlying 'Project Blowed' ethic is concerned, I'd already internalized it," Busdriver explains. "There is a certain amount of intensity and virtuosity that runs rampant through all our music. Even with the variety of styles, there's way to interject someone's perspective and a way to wield the music to compliment their style." This unswerving acceptance alo gave Busdriver a bit more of a penchant towards listening to bands like Clinic and Ugly Casanova, whose influences come out full-force in his projects with DJ Z-Trip and Danger Mouse. 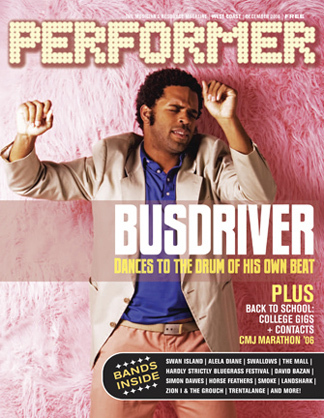 "I'd alway kind of been into rock, but I got a lot more into it when I started dating this one girl," Busdriver laughs. "You know how it is, you hang out with a certain type or girl, you want to be up on a particular kind of music." Luckily, his taste for the music outlasted the relationship, which an aggressive tour schedule and promotional itinerary made impossible anyway. Cross-pollenization and abstract non-sequitors are the defining elemets of Busdriver's new album, RoadKillOvercoat (out next month on Epitaph), making him a kind of Luis Brunel of modern rap. He throws our references to Nietzsche and agnostic plunges on tracks with names like "Ethereal Driftwood" or "The Trglodyte Wins," all the while inserting politically-charged phrasing that invokes Noam Chomsky and neo-con Nazis. Exlains Busdriver, "I'm not really worried about getting my opinions out there, as much as making a response to the fact that there are no balls in those Leftist battles, no counter-myth to the mountain of B.S. the Right has to offer. I wanted to do a couple songs where I could get into that without sounding like a left-leaning Oakie, 'down with the man' rapper. Fortunately the album is too chocked-full with references to pink pregnant pandas to be considered overly political. With his tour schedule clocking in at over 100 live events this year, there's certainly no chance of Busdriver's voice going unheard - a voice that, over the course of his six plus albums and countless collaborations, has been likened to illiam Burroughs hopped up on metamphetamines, a Gatling gun, and "Aesop Rock impersonating Will Smith impersonating a white guy." These comparisons have only heightened fans' intrigue, and led to RoadKillOvercoat coming across as more of "an intricately woven wall of sound than anything I have ever done before," according to Busdriver. "There was a little bit of pop-magic made in the studio, juxtaposed with an organic initial method of laying out the tracks. Albums like Fear of a Black Tangent were tight, but a lot of that was me expressing my dissatisfaction with the current state of the hip-hop culture." Busdriver opts for a more isolated approach to recording and production, working with guys lik Daddy Kev on some tracks and mixing others on his own. "I don't like to be scrutinized when I'm making records, so I just go off and do the damn thing," Busdriver says. "Then I come back and show them the results. [Mush and Epitaph] have trusted me so far, and have been thrilled with the results." That wasn't always the case, however. When Celestial (also home to the transformative hip-hop group Shapeshifters) folded in 2002, right before his album Temporary Forever was due for release, Busdriver was forced to release it under his own makeshift label, Temporary Whatever. "So much of what I do is grassroots - putting CDs in people's hands, running my own promotions, etc. 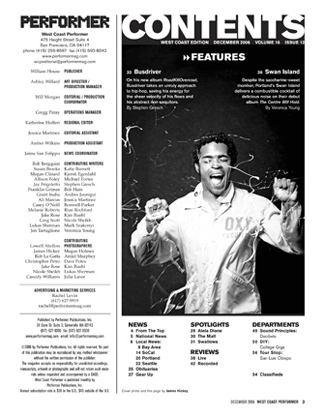 - that there wasn't much of a difference with releasing my own CD," Busdriver says. Then the numbers started coming in. While his first two efforts, Memoirs of the Elephant Man and This Machine Kills Fascists were also self-released, Temporary Forever was a more fully-realized version of Busdriver's style and talents. This was never more clear than on the track "Imaginary Places", in which he flows in time with a flute playing one of Bach's more famous pieces at a rate which practically produces a sonic boom if it's played live. This album, and the Fat Jack-produced collaboration Cater to the DJ, put Busdriver on the national radar and earned him an exponentially higher strata of fans. "It really worked as a catalyst in helping me understand the inner-workings of the industry, reflects Busdriver, "but that also makes you more cynical; more grounded in reality. It was detrimental in the long run as that really isn't me, but I'm grateful in that it fueled my endless pursuit of spewing nonsense in front of young folk." Young folk love Busdriver. They love him so much they don't know what to do with themselves. "This one kid, says a bemused Busdriver, "was too young to get into the show, and wanted to get to meet me afterwards. There was a bit of a crowd, so he just kept yelling, 'Bus! Bus!' and then hit himself six times and walked away. I think he was drunk." Either way, it's indicative of the fact that ther really is no such thing as a set Busdriver fan. A typical show has 40-something short order cooks, indie-rocker fans and French hip-hoppers. "My favorite shows to play are either small, intimate crowds, or big French ones. Maybe Swedish. Current American hip-hop crowds are so jaded, there were actually puddles of drool at my last show at a hip-hop venue. It's sad, but very telling as to the state of hip-hop crowds," says Busdriver. Surprisingly, indie-rockers have been quick to hop on the Bus. This fact is due in part to an unlikely collaboration that originated on the fansite massage board of the Wu Tang clan. When ex-Unicorn Nick Diamonds and L.A. wordsmith Subtitle met up online a few years back, neither one of them knew they'd be touring under the auspices of indie/rap fans as Th'Corn Gangg (which Diamond late referred to as Islands). Unicorns drummer Jamie Tambour, Busdriver and Vick (from Merl) fleshed out the ranks and off they went into the wild blue yonder. "I never quite got [how it started]," reminisces Busdriver, "but they were friends, comrades whose view of the world I valued. It seemed like a good segue for [Diamonds and Tambour], some-thing cathartic after what had happened with [The Unicorns]." When asked about people's reaction to this unusual team-up, Busdriver continued, "It was fun for the whole bunch. People don't think that side projects are fun, but it was pure joy." While rappers have certainly eclipsed their DJs in the last decade, what is an emcee without a purveyor of groove? 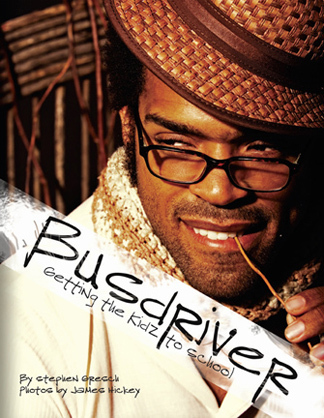 "I'd never had a beat made to fit one of my raps before," Busdriver says. "I'd written raps for other people where that happened, but never on one of my records." Beat master extraordinaire DJ Nobody and programming guru Boom Bip helped Busdriver put together a retinue that i not on;y sonically engaging but can rival anything by Kid Koala or MF Doom for the sheer magnitude of samples and beats. "Some of the songs were recorded in a flash, but I've never spent anywhere near this amount of time in post-production," sighs an exasperated Busdriver. "I think it paid off though; this is my tightest and most cohesive work to date. Nobody and Boom Bip were vital in making it happen." Even when he's not playing a set or pondering his next album, Busdriver's lead foot won't let him slow down. He's constantly writing raps for his friends, paddling merchandise, or working out his "rap muscle" when he gets a chance back at the Project Blowed open mic sessions. He works with producer/performer Daedelus quite often, citing a feelnig of kindred-spirits. "I love working with [Daedelus]. He's one of the nicest people to work with, and is the most non-sequential person I've ever met. I don't think there's any method to his madness," Busdriver says. Whether it's the tangential thought or the customized trigger-box Daedelus uses at his shows, their work together on The Quiet Party remains some of Budriver's most playful and far-reaching. With a genre that's constantly reinventing itself, artists move or die. Whether it's a step sideways, or even backwards, there is no ststus quo to be had in hip-hop. On this note Busdriver charges full steam ahead, slowing infrequently for a "tuck and roll" styled exit. Much like being run down by an out-of-control school bus, seeing Busdriver perform is not something one can easily forget. "Most of my fans find out about me by accident." laments Busdriver. "Usually, they're completely unaware of who I am and just get into the music. That's mostly why I play so many shows." Busdriver takes an unruly approach to hip=hop, one of the heaviest-handed genres of music, by saving is energy for the sheer velocity of his flows and self-promotion. "I don' even know how I get up some mornings, but one thing's for sure - I'd be dead without coffee," Busdriver affirms. Whether it's coffee, rocker girls, or a undamental need to lay down tracks, Busdriver is driven with a demonic fury. With RoadKillOvercoat, he encapsulates modern hip-hop in a way that commercial rappers bending to the socioeconomic pressures of their celebrity never could. With the support of the tight-knit Project Blowed, the growing army of afflicted youngsters, and more DJs than most people could name, Busdriver is in the pole position to careen away from any disaffected hip-hopper's scorn or pop fan's obliviousness.